Failure is a universal topic. Regardless of our path in life, we can all relate to the feeling of falling short of a goal, of not being where you think you should be in life. The ugly truth is that we are own worst critics. The key is to remind ourselves that each attempt is just another opportunity to grow, and Anndie did just that. We recently received an email from Anndie, saying that she felt inspired by our blog to give writing a try to share her story about overcoming her perceived failure. We wanted to share this moment of ‘TruZest’ in hopes that you can relate and feel inspired. All too often, we get trapped in our own limiting beliefs. When in reality, there’s a great possibility that the company might want you for a different position or that same position at a later date. However, we quickly remind ourselves that since we failed the first time, we would most-likely fail the second time–resulting in never having the courage to apply to that same company ever again. Or how about those of you who have failed at passing an important exam and became discouraged? Oh wait that’s me, and I’m totally about to expose myself right now. I have failed my nurse exam three times. Each time I have become more and more doubtful that I will ever pass. Shortly after the 3rd attempt, I completely gave up on trying and fell into a depression. I told myself I wasn’t good enough and shame and embarrassment began to take over. Luckily, I was able to knock that mind set recently and decided to change my attitude. Despite my feelings of despair, I made up my mind to give it another shot. I am currently taking classes to prepare for my next exam. My determination is now stronger than ever. I’m not giving up because I know I CAN DO THIS! We often think that failure is the end of the road, no sign of hope ahead. 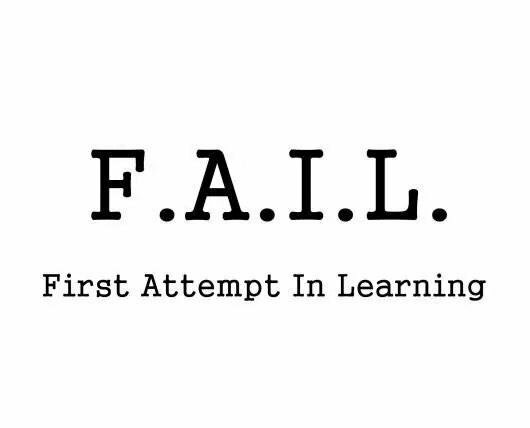 What we fail to realize is that failing is only the First Attempt In Learning. To overcome it, we must pick ourselves up and keep trying. The best leaders have failed hundreds of times before ever succeeding. However, the characteristic that sets them apart is that they were persistent. Could you be unsuccessful that many times without feeling discouraged? Probably not, but the lesson here is to never give up. If Thomas Edison didn’t quit after 999 attempts, then it goes without saying—anything is possible if you just put your mind to it. Side note: Imagine having to walk around with an oil lamp or candle in today’s day and age hehe. The next time you feel like you’ve failed, remember it’s just another stepping stone towards the correct path. Recondition the boundaries you set in your own mind. You are only holding yourself back. Thomas Edison believed he could, and so can you. I personally think that one who falls and gets up is much stronger than the one who never felt the sting of failure. After all, the only true failure is when YOU decide to stop trying. So do yourself a favor, don’t fail yourself.